I think Daytrotter was made just for me. It’s true, that’s what they do. The first time I called, I left with four songs each from: Air Waves, Cults, Brazos, First Aid Kit, Black Lips, The Black Angels, Dawes, Jeff The Brotherhood, Wire, Tame Impala, The Vivian Girls, Wye Oak, The Cave Singers, The Mynabirds, The Bowerbirds, Headlights and that hollerin’ Shilpa Ray and Her Happy Hookers. Not wanting to overstay my welcome (or seem greedy) I thought that would do for one day. I would actually like to take this opportunity to apologise to Daytrotter – I thought you were all crazy when we first met – SORRY – I realise now you just love music and go to extraordinary lengths to prove it. I understand that – and really appreciate it – ’cause I’m the same. So what’s Daytrotter about then? Back in 2007 Wired Magazine suggested that the concept of the Peel Sessions lived on at Daytrotter, this was back when Daytrotter had recorded 150 sessions and had around 600 songs on tape. Legendary Radio One DJ John Peel recorded countless sessions of his favourite or newly discovered bands; usually four or so songs, quickly, and with minimal overdubs – if any. This is pretty much the Daytrotter modus op’, and they’ve been doing it for years now, since early 2006. They record one touring band each day, four songs apiece, consequently they have a catalogue of some 1100 sessions and some 4640 songs. See what I mean about crazy? There is a live ambiance to the Daytrotter recordings, this will have much to do with the fact that a minimal amount of microphones are used, no overdubs are made, and the session is recorded direct to analog tape. These intimate performances, particularly apparent with the vocals, leave the songs sounding impassioned, if sometimes vulnerable; but for the listener it’s like being in the same room. The Horseshack studio’s ability to capture the essence of the vocalist’s delivery is a common theme running throughout these sessions, it is placed to the fore, an untempered, unadulterated raw source, treated like a precious thing. 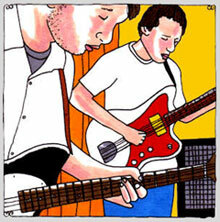 The idea of Daytrotter is not to break new bands; this doesn’t stop them having their noses to the ground though. Avi Buffalo for instance, recorded their Daytrotter session in December 2009. Drummer Sheridan Riley was still in high school and Avi and Co. were still several months away from impressing at South By Southwest (in March the following year) and a few more months away from the release of their début album that April. All the Daytrotter sessions are available free for the price of signing up as their friend, these downloads are 128kb mp3’s. A recent addition to Daytrotter is the Record Barn selection, these are the full uncompressed sound files and can be purchased for around US$4.00. Sean Moeller is a former journo with the local newspaper, the Quad-City Times, he is a founder of Daytrotter. Not satisfied with giving us the musical truth, Sean Moeller invests us with a unique take on the artist, his accompanying essays are full of wit, insight and vignetted observations. The iconic charm of Johnnie Cluney’s illustrations balance Sean’s block-of-wood text (he hardly ever uses paragraphs), Johnnie’s felt-marker line-work, vibrant but minimal swatches of colour and variant depictions of speech bubbles are such a graphic-identity it’s hard to imagine what Daytrotter would look like without them. Daytrotter sessions come to us from the Horseshack studio in Rock Island, Illinois, population – about 40,000. The Mississippi runs at its feet and apart from paddle-steaming river traffic it made itself known to the rest of America through the establishment of the Chicago, Rock Island & Pacific Railroad in 1851. The same Railway Company immortalized in that Americana folk song, Rock Island Line. The Ruby Suns completed a remarkable session, it followed a tour in late 2008 that left them “fried out and needing to just get home,” this session was recorded the night before flying out of the U.S. If it is the tour’s legacy that has left Ryan’s voice strained in any way it shows up emotionally warm and remarkably agile. Glowing. The Brunettes recorded their session in January 2008, following the release of Structure & Cosmetics after signing to Sub-Pop. I have a new-found appreciation for the Brunettes, with a 5-piece band in tow, including the elegantly wistful pedal-steel of Raymond Richards this is just the result the Daytrotter experience can elicit from a group. Ace. Cut Off Your Hands lead singer Nick Johnston endeared himself to Daytrotter – enough for Sean Moeller to describe him as a “spastic young man.” – purely for his energetic antics mind. Moeller appreciated that energy and enthusiasm – and liked even more its translation to their music – “…the kind of excitement that Johnston allows to work up inside – is the exact same effect the band’s sonic output throws at all who are listening.” Electric. Sarah at We Don’t Get Out Very Much interviewed Sean back in 2008. There’s a cool interview with Sean on YouTube. The Daytrotter horse gets the last word. This entry was posted in Music and tagged Cut Off Your Hands, Daytrotter, Horseshack Recording Studio, Johnnie Cluney, Rock Island, Sean Moeller, The Brunettes, The Ruby Suns. Bookmark the permalink.